There is not much lettuce in gardens right now, though the produce aisle has plenty. And maybe you are a lucky owner of a cold frame or hoop house where spring comes a couple months before it does outside. Where warm weather makes a fluffy pile of greens a welcome sight, colder weather calls for more substance in our salads. 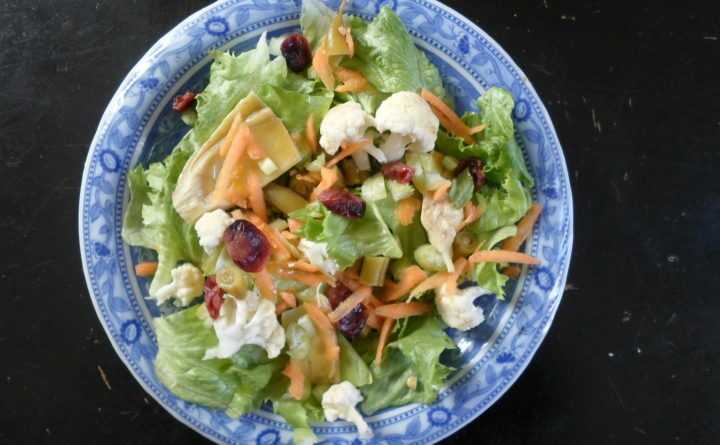 Sharon Frost in Calais sent along the recipe for a winter tossed vegetable salad, which served as an inspiration for the one that follows. I used the winter idea to think about vegetables that lend themselves to being included in salad, are hearty enough to stand up to a blast of cold and that are available in winter either in my cellar storage or at grocery stores. Not tomatoes, peppers or zucchini, but sturdier sorts such as cauliflower, broccoli, carrots and celery. These are vegetables that fortify and fill us. For my salad, I had carrots, cauliflower, dilly beans and a couple pieces of marinated artichoke hearts. I could also have used a little grated rutabaga, yellow beet or shaved or grated butternut squash, plus dill pickles. I like to blanch cauliflower or broccoli because it intensifies their flavors and makes them a little more amenable to chewing. Suit yourself with the amount of lettuce you use. I wanted as much lettuce as I had of the other ingredients. For every cup of solid veggies, I allowed a cup of lettuce. You might want more or less. It is up to you. Here is another trick, which is particularly useful if you make a salad to take to a potluck or to consume later at the table but which you don’t wish to dress until just before you eat it. Put the salad dressing, or ingredients for it, in the bottom of your salad bowl, and top it with the salad stuff, then toss it when you are ready to serve. Oddly, salad at the bottom of the bowl doesn’t get soggy. I sometimes add salad embellishments like croutons or dried cranberries or toasted sunflower seeds. You might want to, too. It’s all good. 1. Put your salad dressing into the salad bowl. 2. Add the cauliflower, broccoli, carrots, celery, shallot, dried cranberries and pickles to the bowl. 3. Top that with shredded lettuce. 4. When ready to serve, toss the salad, and add salt and pepper to taste.